Lynn is a city in Essex County, Massachusetts, United States. The population was 90,329 at the 2010 census. An old industrial center, Lynn is home to Lynn Beach and Lynn Heritage State Park and is about 10 miles (16 km) north of downtown Boston. It is the largest city in Essex County. The area known as Lynn was first settled in 1629 by Edmund Ingalls (d. 1648), followed by John Tarbox of Lancashire in 1631, whose descendants still reside in New England. 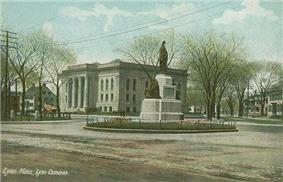 The city was incorporated in 1631 as Saugus, the Nipmuck name for the area. The name Lynn was given to the area after King's Lynn, Norfolk, England, in honor of Samuel Whiting. A noteworthy colonist, Thomas Halsey left Lynn to settle the eastern end of Long Island and founded the town of Southampton New York. The Halsey House is the oldest frame house in the state of New York (1648), and along with the homestead it is open to the public and managed by the Southampton Colonial Society. After Lynn's resettlement, many of its areas gradually separated into independent towns. 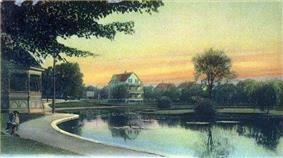 Reading was created in 1644, Lynnfield in 1782, Saugus in 1815, Swampscott in 1852, and Nahant in 1853. Lynn was incorporated as a city in 1850. Colonial Lynn was a major part of the regional tannery and shoe-making industries that began in 1635. The boots worn by Continental Army soldiers during the Revolutionary War were made in Lynn. The shoe-making industry drove urban growth in Lynn into the early nineteenth century. This historic theme is reflected in the city seal, which features a colonial boot. In 1816, a mail stage coach was operating through Lynn. By 1836, 23 stage coaches left the Lynn Hotel for Boston each day. 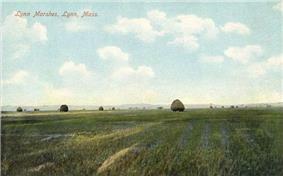 The Eastern Railroad Line between Salem and East Boston opened on August 28, 1838. This was later merged with the Boston and Maine Railroad and called the Eastern Division. In 1847 telegraph wires passed through Lynn, but no telegraph service station was built until 1858. Lynn Shoe manufacturers, led by Charles A. Coffin and Silas Abbott Barton, invested in the early electric industry, specifically in 1883 with Elihu Thomson and his Thomson-Houston Electric Company. That company merged with Edison Electric Company of Schenectady, New York, forming General Electric in 1892, with the two original GE plants being in Lynn and Schenectady. Charles A. Coffin served as the first president of General Electric. Elihu Thomson later served as acting president of the Massachusetts Institute of Technology from 1920 to 1923. Initially the General Electric plant specialized in arc lights, electric motors, and meters. Later it specialized in aircraft electrical systems and components, and aircraft engines were built in Lynn during WWII. That engine plant evolved into the current jet engine plant during WWII because of research contacts at MIT in Cambridge. Gerhard Neumann was a key player in jet engine group at GE in Lynn. The continuous interaction of material science research at MIT and the resulting improvements in jet engine efficiency and power have kept the jet engine plant in Lynn ever since. On February 1, 1865, Mary Baker Eddy experienced the "fall in Lynn", believed by Christian Scientists to mark the birth of their religion. 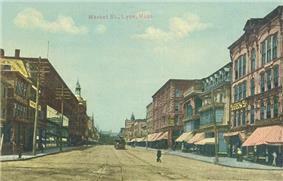 Lynn's population peaked around 1930 at just over 102,000; the population today is roughly where it was in 1910. The median household income for Lynn is well below the statewide average. Lynn suffered several large fires in the late 1970s and early 1980s, including a devastating inferno among former shoe factories at Broad and Washington Streets on November 28, 1981. The blaze destroyed 17 downtown buildings undergoing redevelopment, with property losses totaling in the tens of millions of dollars. The site has since been largely redeveloped into a satellite campus of North Shore Community College. Due to a reputation for high crime that has persisted since the beginning of industrialization, a taunting rhyme about Lynn has been known throughout Eastern Massachusetts ("Lynn, Lynn, the city of sin, you'll never come out the way you went in, what looks like gold is really tin, the girls say 'no' but they'll give in, Lynn, Lynn, the city of sin"). Another popular saying, was "Lynn, Lynn the city of sin: if you ain't bad, you can't get in!". In order to end the popular chant, city solicitor Michael Barry proposed renaming the city to Ocean Park in 1997, but this failed to pass. Lynn remains home to a division of General Electric Aviation, a major employer; the West Lynn Creamery (now part of Dean Foods's Garelick Farms unit); C. L. Hauthaway & Sons, a polymer producer; Old Neighborhood Foods, a meat packer; Lynn Manufacturing, a maker of combustion chambers for the oil and gas heating industry; Sterling Machine Co.; and Durkee-Mower, makers of "Marshmallow Fluff". First air mail transport in New England, from Saugus, MA to Lynn, MA. Later, some of these claims were found to be inaccurate or unprovable. The first wave of immigration began in the early 1900s when many Jewish people emigrated from the Russian Empire (mostly from Ukraine) to Lynn; Lynn thus became home to one of the largest Russian-speaking communities in the North Shore. Today, with one quarter of its residents of Hispanic origin, it joins nearby East Boston and Chelsea as an important center of the Latino community of the Boston area. In the early 2000s, a number of new development projects have contributed to what officials hope will be the city's renaissance. Industrial buildings that were formerly vacant have been converted into loft spaces by real estate developers. Encouraged by local developer Tom Kennedy, New Urbanist architect Robert Orr proposed a series of charrettes for the redevelopment of Lynn's waterfront in conjunction with Lynnfield Engineering. City Hall is encouraging the community's resurgence, with new antique-style lighting, signage, brickwork, and a multipurpose municipal football stadium. In late 2009, Judith Flanagan Kennedy became mayor by a margin of only 27 votes (out of a vote total of over 16,000), beating out two-term incumbent mayor Edward J. Clancy. Arts and culture have been at the forefront of the revitalization taking place in Downtown Lynn. Over the past several years arts organizations, restaurants & more have moved downtown. In 2012, the Massachusetts Cultural Council named downtown Lynn as one of the first state recognized arts and culture districts in Massachusetts. The Downtown Lynn Cultural District (DTLCD) is a collaboration of the various businesses and organizations in the district, and its director is Emily Ruddock. In 2014 Kennedy stated that an increase of illegal immigrants is causing several city agencies to be "overwhelmed", including Lynn Public Schools. Lynn is located at (42.473996, −70.955583). According to the United States Census Bureau, the city has a total area of 13.5 square miles (35 km2), of which 10.8 square miles (28 km2) is land and 2.7 square miles (7.0 km2) (19.87%) is water. Lynn is located beside Massachusetts Bay and the Atlantic Ocean. Lynn's shoreline is divided in half by the town of Nahant, which divides Lynn Harbor to the south from Nahant Bay to the north. The city lies north of the Saugus River, and is also home to several brooks, as well as several ponds, the largest being Breed's Pond and Walden Pond (which has no relation to a similarly named pond in Concord). More than one-quarter of the town's land is covered by the Lynn Woods Reservation, which takes up much of the land in the northwestern part of the city. The city is also home to two beaches, Lynn Beach and King's Beach, both of which lie along Nahant Bay, as well as a boat ramp in Lynn Harbor. Lynn is located in the southern part of Essex County, and is 5 miles (8.0 km) southwest of Salem, 10 miles (16 km) northeast of Boston, and 22 miles (35 km) west-southwest of Cape Ann. The city is bordered by Nahant to the south, Swampscott to the east, Salem to the northeast, Peabody to the north, Lynnfield to the northwest, Saugus to the west and Revere (in Suffolk County) to the southeast. Lynn's water rights extend into Nahant Bay and share Lynn Harbor with Nahant. There is no land connection to Revere; the only connection is the General Edwards Bridge across the Saugus River. Besides its downtown district, Lynn is also divided into East Lynn and West Lynn, which are further divided into even smaller areas. Ward 1 / Lynnfield St.
Surfers in the Atlantic seen from Red Rock Park, with view of Boston skyline in the distance. Lynn has no full highways, the nearest being U.S. Route 1 in Saugus and the combined Interstate 95 and Route 128 in Lynnfield. Route 1A, Route 107, Route 129 and Route 129A all pass through the city. Route 107 passes from southwest to northeast along a relatively straight right-of-way through the city. It shares a 0.5 miles (0.80 km) concurrency with Route 129A, which follows Route 129's old route through the city between its parent route and Route 1A. Route 129 passes from the north of the city before turning south and passing through the downtown area and becoming concurrent with Route 1A for 1 mile (1.6 km). Route 1A passes from Revere along the western portion of the Lynnway, a divided highway within the city, before passing further inland into Swampscott. The Lynnway itself runs along the coastline, leading to a rotary which links the road to Nahant Road and Lynn Shore Drive, which follows the coast into Swampscott. Lynn has a stop on the Newburyport/Rockport Line of the MBTA Commuter Rail, as well as the River Works stop for GE Aviation employees at the River Works. A number of other stations were open until the mid 20th century. Numerous MBTA bus routes also connect Lynn with Boston and the neighboring communities. An extension of the Blue Line to downtown Lynn has been proposed, but not funded. The nearest airport is Boston's Logan International Airport, about 5 miles (8.0 km) south. In December 2007, the Massachusetts Seaport Advisory Council approved $750,000 in funding for a commuter ferry from Lynn to Boston. The Massachusetts Seaport Advisory Council provided a $1.3 million grant for Phase 2 of the project in October 2010. Lynn gets cold, snowy winters and warm, humid summers. The other two seasons are mild, in general. As of the census of 2010, there were 90,329 people, 33,310 households, and 20,988 families residing in the city. Hispanic or Latino of any race were 32.1% of the population (10.5% Dominican, 6.3% Guatemalan, 5.4% Puerto Rican, 2.8% Salvadoran, 1.7% Mexican, 0.6% Honduran, 0.4% Colombian, 0.4% Spanish, 0.2% Peruvian, 0.2% Cuban). Cambodians form the largest Asian origin group in Lynn, with 3.9% of Lynn's total population of Cambodian ancestry. Other large Asian groups are those of Vietnamese (1.0%), Indian (0.4%), Chinese (0.3%), and Laotian (0.2%) ancestry. In the city the population was spread out with 24.9% under the age of 18 and 75.1% over 18. Males accounted for 49% and Females 51%. Between 2007 and 2011, the median household income in Lynn was $44,367. Males had a median income of $34,284 versus $27,871 for females. The per capita income was $22,190. About 19.2% of the population is considered below the poverty line. In 1990 Lynn had 2,993 persons of Asian origin. In 2000 Lynn had 5,730 Asians, an increase of over 91%, making it one of ten Massachusetts cities with the largest Asian populations. In 2000 the city had 3,050 persons of Cambodian origin, making them the largest Asian subgroup in Lynn. That year the city had 1,112 persons of Vietnamese origin and 353 persons of Indian origin. From 1990 to 2000 the Vietnamese and Indian populations increased by 192% and 264%, respectively. By 2004 the Cambodian community in Lynn was establishing the Khmer Association of the North Shore. Lynn Woods Reservation, the largest municipal park in New England, falsely stated as currently being the second largest in the country, at 2,200 acres (8.9 km2). Several historical sites such as Stone Tower, Steel Tower, the Wolf Pits, and Dungeon Rock, believed to be the site of still-unrecovered pirate treasure, are located here. Many schools have cross-country track meets in Lynn Woods. 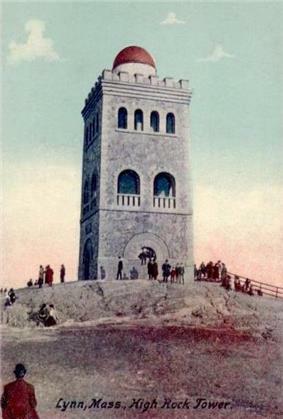 High Rock Tower, a stone observation tower with a view of Nahant, Boston, Downtown Lynn, Egg Rock, and the ocean. The top of the structure houses a telescope, which is open for the public to use. Pine Grove Cemetery, one of the largest cemeteries in the country. Ripley's Believe It or Not once claimed the fieldstone wall around the cemetery was the "second longest contiguous stone wall in the world", after the Great Wall Of China. Fraser Field, municipal baseball stadium constructed in the 1940s under the Works Progress Administration. It has housed many minor league baseball teams and a few major league exhibition games for the Boston Red Sox. Currently, it is the home of the North Shore Navigators of the Futures Collegiate Baseball League. Manning Field, the municipal football stadium. It is the former site of Manning Bowl (circa 1936 – August 2005). Spring Pond, historic retreat of wild woodlands. The North Shore Adult Day Health Center in Lynn, which opened in January 2009, caters to persons of Hispanic and Latino origin in Lynn and surrounding cities. Lynn has three public high schools (Lynn English, Lynn Classical, and Lynn Vocational Technical High School), four junior high schools, two alternative schools, and, as of Autumn 2015, 18 elementary schools. They are served by the Lynn Public Schools district. 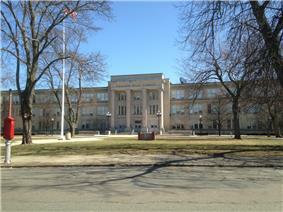 There is also an independent Catholic high school located in the city, St. Mary's High School. Also, there are three religious K–8 elementary schools, and one interdenominational Christian school, North Shore Christian School. KIPP: the Knowledge Is Power Program operates the KIPP Academy Lynn, a 5–8 charter middle school, in Lynn and has also opened KIPP Academy Lynn Collegiate to serve high school students in the city. North Shore Community College has a campus in downtown Lynn (with its other campuses located in Danvers and Beverly). Neil Hamilton, actor who played "Commissioner Gordon" on the 1960s TV series Batman. Lynn is mentioned in a number of books by contemporary authors, including Stephen King's Cell and Everything's Eventual and a number of books by Keith Ablow. Lynn is mentioned in Sylvia Plath's autobiographical novel The Bell Jar. Many versions of the Mother Goose nursery rhyme "Trot, trot to Boston" include Lynn as the second destination. Episodes of the reality series Cops focusing on Boston often include one segment in Lynn. Martin Scorsese's 2006 crime thriller The Departed has a scene take place in Lynn, in which Matt Damon's character investigates a crime scene and exchanges words with a Lynn police detective. Many scenes from the movie The Surrogates were shot in Lynn. 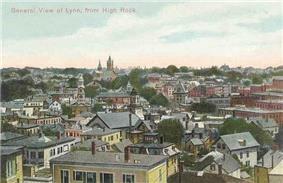 Lynn is also the birthplace of Aaron Corbett, the main character of Thomas Sniegoski's book series, The Fallen. Scenes from Adam Sandler's 2012 movie That's My Boy were filmed throughout different parts of the city. Freddie Quell, Joaquin Phoenix's character from the 2012 movie The Master, was said to be from Lynn. Lynn is the birthplace of Ernie Anderson. He is best known for his portrayal of "Ghoulardi," on Cleveland television in the early 1960s, and as the main promotional voice of the ABC network from the late 1970s until the mid-1990s. He is the father of film director Paul Thomas Anderson. ^ Tarbox Family Crest and History. Houseofnames.com (2012-12-25). Retrieved on 2013-09-18. ^ Herbert, George. 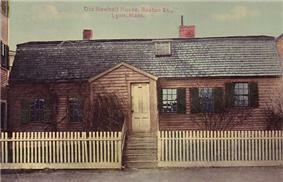 History of Lynn... 1629–1864, 1890. ^ USigs.org, History of Lynn Ch2-1814–1864 pub1890. ^ Méras, Phyllis (2007). The Historic Shops & Restaurants of Boston. p. 56. ^ Kerry, John (2007-11-27). "Don't Leave New England Families Out in the Cold". United States Senate. Archived from the original on January 6, 2010. Retrieved 2010-01-13. ^ Daley, Beth (1997-03-06). "Rhyme may be reason to change Lynn's name". Boston Globe. Retrieved 2010-01-13. 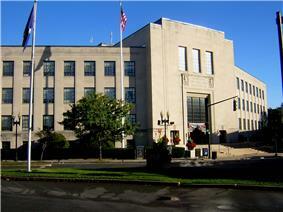 ^ "ELECTION SUMMARY REPORT: Municipal Election – November 3, 2009, Lynn, MA.". Lynn City Clerk and Elections. City of Lynn. Retrieved 2010-08-20. ^ Mason, Edward (January 8, 2010). "Lynn mayor: City Hall e-mails, files cleaned out by predecessor". Boston Herald. Retrieved 2010-08-20. ^ "Downtown Lynn Cultural District". Official Website. Retrieved 25 February 2015. ^ Haynes, Crystal. "Lynn officials: Illegal immigrant children are stressing city services" (Archive). Fox News Boston. Retrieved on September 20, 2014. ^ Liscio, David (October 12, 2010). "City gets $1.3 million for ferry project". The Daily Item of Lynn. Archived from the original on October 12, 2010. Retrieved October 12, 2010. ^ "1950 Census of Population" (PDF). 1: Number of Inhabitants. Bureau of the Census. 1952. Section 6, Pages 21–7 through 21-09, Massachusetts Table 4. Population of Urban Places of 10,000 or more from Earliest Census to 1920. Retrieved July 12, 2011. ^ a b c "Profile of General Population and Housing Characteristics Lynn, MA: 2010". American FactFinder – United States Census Bureau. 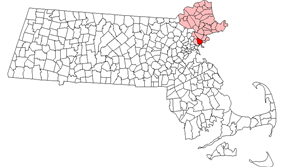 ^ "Lynn (city), Massachusetts Quick Facts". United States Census Bureau. ^ a b Buote, Brenda J, "Asian population up in small cities" (Archive). Boston Globe. June 13, 2004. Retrieved on September 10, 2015. 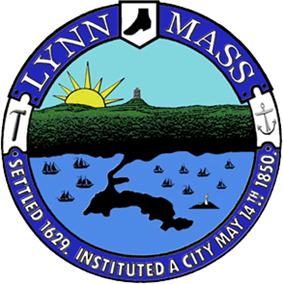 ^ "City of Lynn". Official Website. Retrieved 25 February 2015. ^ Masis, Julie. "Latinos feel at home in senior center" (Archive). Boston Globe. March 12, 2009. Retrieved on September 9, 2015. ^ Lynn Public Schools. "School Profiles". Retrieved 2007-08-02. ^ Massachusetts Department of Education. "Lynn — Directory Information". Retrieved 2007-08-02. ^ King, Stephen. Cell. p. 365. ^ Ra, Carol F. (1987). Trot, trot, to Boston: play rhymes for baby. New York: Lothrop, Lee & Shepard Books. . "Trot, trot, to Boston; Trot, trot, to Lynn; Trot, trot, to Salem; Home, home again." ^ "Boston, MA 6". Cops. Episode 108. 1991-12-14. ^ "Boston/New City, MA". Cops. Episode 317. 1996-11-12. Lewis, Alonzo and James Robinson Newhall. History of Lynn, Essex County, Massachusetts: Including Lynnfield, Saugus, Swampscott and Nahant. Published 1865 by John L. Shorey 13 Washington St. Lynn. : Panoramic View of the Hutchinson Family Home on High Rock including all of Lynn, Massachusetts published 1881 by Armstrong and Co, at the LOC website. D'Entremont, Jeremy. Egg Rock Lighthouse History. Website. Carlson, W. Bernard. Innovation as a Social Process: Elihu Thomson and the Rise of General Electric, 1870–1900 (Cambridge: Cambridge University Press, 1991). Haney, John L. The Elihu Thomson Collection American Philosophical Society Yearbook 1944. United Press International. "Blaze destroys urban complex in Lynn, Mass." 'The New York Times,' November 29, 1981. Page 28.